I was a bookish child, at any one time either getting lost in some fantasy adventure or learning new facts. Some kids take comic books into the bathroom, but according to my mother, I insisted we keep an encyclopedia by the toilet. I also had a creative streak. Writing poetry for Christmas, painting in oil, pastels or chalk, setting up a detective agency with my best friend, or practicing circus acts – I loved trying new things. In a way, many of these traits survived into adulthood, except nowadays I channel my creative urges into writing. When my Nana lent me money so I could buy a car, her condition was that each repayment was to be accompanied by a story. Over time, these chapters morphed into a book. After my nan died, finishing the story was too painful a prospect, but the seeds had been sown. Writing became the perfect outlet for my overactive imagination. Can you tell us about your most recent release? 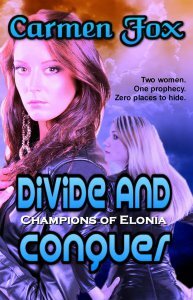 DIVIDE AND CONQUER is the story of two women caught up in one destiny. Since Lea and Nieve are fundamentally different, their path might be the same, but their journeys aren’t. Saving the world would be so much easier if they could just get on with it, but the men they choose have their own agendas that tend to get in the way. Lea and Nieve have to overcome external roadblocks and do some soul searching before they even have a shot of getting the job done. The most exciting aspect of writing is to try something new. First off, I wanted to write a buddy story, like ‘Lethal Weapon’ with chicks. Next I wanted to explore a situation in which the heroes fail. I’m not talking about a setback, but the complete and utter failure of what they set out to do. Bit by bit, DIVIDE AND CONQUER fell into place. Are you asking me to choose a favorite child? I guess I admire Nieve for her willingness to re-evaluate long-held beliefs. I identify most with Lea, though, because she’s a geek, trying to find purchase in this world one way or another, but always being the odd one out. That said, Kirk, the chain-smoking gargoyle, steals the show for me. Using alternating points of view meant that Lea and Nieve had to have distinct voices. They have different experiences and different goals in life, so for them to establish any sort of partnership or friendship, they needed to share a sense of humor. Balancing the two was quite a tight-rope walk. To write stories that challenge me about characters that readers can connect with. In July, my next book GUARDED is due to be released. It has quickly become a beta reader favorite, so I’m currently writing a novella set in the same world. Learn. Practice. Repeat. I’m still doing that. With luck, I’ll be able to look back at my work in ten years and cringe at how bad it is. I trotted to the corner by the window and picked a collection of stuffed animals off the armchair. From the deep V between Lea’s brows, I concluded her thought processes weren't going anywhere fast. Once the toys occupied the windowsill, neatly arranged by height, I sat. I enjoyed your blog interview, your cover looks great. How inspiring that your Nan got you to write to her... A lovely way to start writing stories or a book.